One of the Celtic Giants. Also known as Lugaidh and Molloch, Moluag was born c.530AD of the clan Dalaraidhe, in northern Ireland where he became a monk of Bangor. Many consider his true name to have been Lugaidh (pronounced Lua) and the form of Moluag, used in the Annals of Tigernach, is simply an affectionate form - Mo-Luoc, "my Lugaidh". St Moluag's plan for working Pictland was to organize three great muinntirs or communities to be the centres of education and ministerial supply for the Churches in their respective districts; and, of course, for the maintenance of these central communities he had the reserves of the mother church of Bangor in Eire. He first organised the great community of Lismore in Lorn about 562AD. Moluag's settlement was in the north of Lismore, close to a megalithic site surmounted by a high cairn which once marked the funeral pyres of Pictish Kings. This island was the sacred island of the Western Picts, and continued to be the burial-place of their kings who reigned at Beregonium. The Churches dependent on Lismore, still traceable, are Teampul Mór in Lewis; the Church of Pabay, that is, Isle of the pápa; Cill Moluag in Raasay; Teampull Mholuig, "Moluag's Chapel", at Europie in Ness; Cill Moluag in Skye; Cill Moluag in Tiree; Cill Moluag in Mull; 'Kilmalu' in Morvern; 'Kilmalu' of Inverary; and Cill Moluag at Ballagan, Inverfarigaig. St Moluag's second central community is said to have been organised at Rosemarkie on the northern shore of the Inverness Firth (however, see below). Many of the churches founded from this centre were afterwards, in the Roman Catholic period, dedicated to Roman saints, and they cannot now be definitely distinguished as St Moluag's; but there was an old church in the strath of the Peffray (Strathpeffer) whose temporalities are still called Davoch-Moluag, and the submerged Church of Cromarty was evidently one of St Moluag's foundations. His third central community was at Mortlach in Morayshire. Dependant upon it was the smaller community at Clova or Cloveth near Lumsden village. The foundations that still bear St Moluag's name in this part of Scotland are at "Maol-Moluag's", now New Machar, at Clatt in the Garioch and at Migvie (also linked to St Finan) and Tarland. Another of St Moluag's known foundations was at Alyth in Perthshire. Site of Moluag's muinntir at Cloveth. His crozier, Bacchuill Mór, "the great staff", a piece of blackthorn 34 inches long and originally covered in a gilded copper case, is preserved on Lismore in Bachuil village in the care of the Livingstone family; having been for some time in the custody of the Dukes of Argyll. Because of their associations with the Bacchuill Mhór this Livingstone family holds the ancient title of Barons of Bachuil. Of course, it will not escape the attention of the reader that St Moluag's three main foundations at Lismore, Rosemarkie and Mortlach in time became the seats of the ancient medieval Roman Sees of the Isles, Ross and Aberdeen. 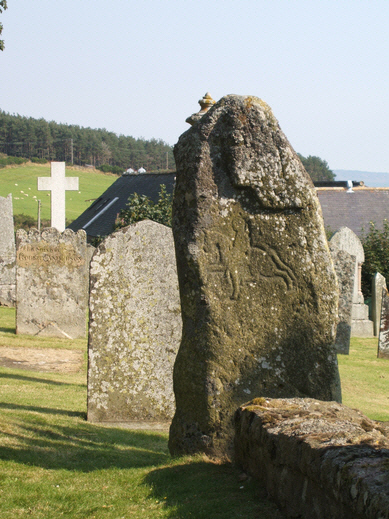 It must not be supposed that the trained clergy from Bangor and from St Moluag's own centres kept themselves apart from the Britonic and the native Pictish clergy who were at work in Pictland at this time; because there is evidence that the Bangor clergy assisted in manning Churches founded long before their arrival as well as looking to the care of congregations gathered by themselves. The only sign of want of co-operation between the Celtic clergy, as might be expected from the political relations of the time, was between the Picts and the Gaidheals or Scots, in the territory occupied by the Scotic colonists in Dalriada. There was certainly no co-operation between the Pictish ecclesiastics and the Gaidhealic ecclesiastics in the island of Tiree! Incised stone at Migvie, Cromar. There is some discrepancy with regard to St Moluag's burial place. Until recent times the tradition on Lismore itself was that Moluag died at Ardclach and that his body was born back to Lismore by twenty-four of the most stalwart islanders. This tradition is very much in keeping with the Celtic tradition of burying a saint in his main or oldest foundation. Another source gives that the story of Moluag being buried at Rosemarkie is false and repeats the story that his body was taken to Lismore. It goes further by relating that there was a later Moluag, a colleague of St Boniface, and that he was a great preacher. It is said that it is this second Moluag, who died over a hundred years after the first, that was buried in Boniface's chapel at Rosemarkie. It has to be said that, if one is to accept the first Moluag's association with the district round Rosemarkie then it is surprising that there are so very few churches which bear his name. Even where original Celtic saints names were replaced with Roman ones, it is rare for the original to completely disappear. This story of a second Moluag may have an essence of truth in it!